Once you’ve put the sofa and coffee table or the bed and dresser in place, it’s time to dress up the room with colorful and textural accents. If the major furniture pieces give a room stability, the accessories provide its spark. Check out eight accents that should be a part of every home’s décor. A beautifully framed mirror is the easiest way to accent a wall, “enlarge” a room, and lighten up a dark space with just a hammer and a few hooks. Install a mirror over something with substance like a fireplace or bed for maximum effect. 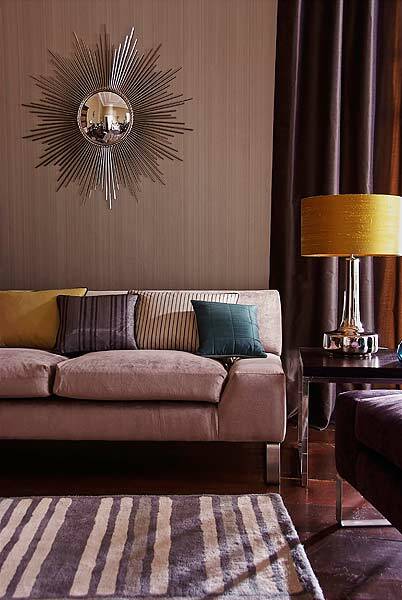 “I love to mix metals, shapes, and sizes,” says Brooke Lang, a Chicago interior designer who runs Brooke Lang Design. If she’s putting together a wall of artwork, she’ll add a mirror to the mix just for fun. Like a scarf that keeps your neck both warm and chic, a decorative blanket casually thrown over a sofa or chair conveys a coziness that practically raises a room’s temperature. While you’ll want to reserve the fleece variety for the bedroom, wool and cotton blankets are perfect for adding color and texture to the living room and den. To make yours look “casually thrown,” fold it in thirds, then drape it over a corner of the couch and tuck in the back edge. You could also place a throw pillow in front of it, for an extra boost of laid-back beauty. More than just a dinner-party staple, these waxy wonders set a mood –romantic, mysterious, elegant. Pair them with pretty candlesticks and put them, unlit, on a sideboard or mantel when they’re not lighting up the dining table. Candlesticks don’t have to be matchy-matchy: Group tall and short ones made of the same material (glass, nickel, brass) for an eclectic but harmonious look. Don’t underestimate the importance of a throw pillow. Whether they’re cotton or suede, pink polka dotted or zebra striped, these decorative accents add style and substance to a sofa or chair. Lang likes to customize them – she’ll stuff a 26-inch pillow insert into a 24-inch pillow cover for a fuller, more luxurious look. Take a cue from Mother Nature and fill your home with living, breathing green things. Whether you choose ferns or a ficus, you’ll be adding vitality to your décor that faux plants can’t match. The non-decorative bonus that can’t be overlooked? Studies have shown that plants can reduce stress and remove toxins from your home. Put one in every room and breathe easy. If you want to anchor a room, lay down a beautiful rug that works with other colors in the space. Besides giving a bare floor a finished look, a rug provides warmth when a house gets chilly. To avoid a cramped look, leave at least 12 inches of floor surface around the rug’s four borders. These books are for so much more than reading – they also add personality to a room. “I’m always hunting for unique books that tell a story,” Lang says. No matter what the subject is, from Paris to the Civil War, the books should always be oversized with a thick spine. Look for interesting covers, too, to show off a book’s best side.